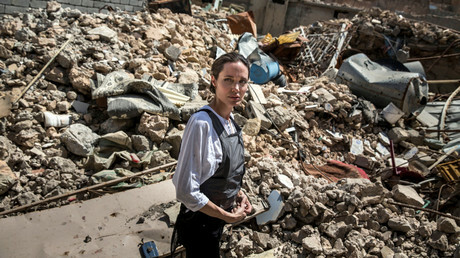 “There are bodies in this rubble that stay here and you can smell the bodies and some of them have family members that are here and they are unable to move them,” the Hollywood superstar and Special Envoy for the High Commissioner for Refugees (UNHCR) said, after exploring a part of Mosul that was recaptured last year with the US-led coalition’s active support. Even though this was Jolie’s fifth trip to Iraq, the horrific destruction she witnessed in the Old City this time really broke her heart. Walking around the narrow streets of the city center, completely destroyed by artillery and airstrikes, the 43-year-old Oscar winner called it the “worst devastation” she saw in her 17 years representing the UNHCR across the globe. “This is the worst devastation I have seen in all my years with UNHCR. These people have lost everything and the trauma and the loss they have suffered is unparalleled,” Jolie said. “Displacement is still happening. The camps near the city are still full. Whole areas of West Mosul remain flattened. Enabling people to return and stabilizing the city is essential for the future stability of Iraq and the region,” she said, in a statement. After Iraqi Prime Minister Haider al-Abadi declared the city liberated in July, 2017, the government has done little, and received even less support from its allies, to reconstruct the once-thriving city, Iraq’s second largest. An estimated 90 percent of West Mosul, where the historical part of town is located, was destroyed or significantly damaged during the nine-month siege by Iraqi forces, supported by the US-led coalition. It will now cost Baghdad an estimated $ 88 billion to rebuild the country following the devastating battle against IS, money which the government simply lacks, and Western partners are reluctant to provide. “I call on the international community not to forget Mosul, and not to turn their attention away from its people. We have learnt in Iraq before and elsewhere in the region the dangers of leaving a void. It is also what the families and survivors deserve,” Jolie said.